No Man’s Sky’s latest update allows players to build bases anywhere, unlike the previous version of the game, where you could only build in preset locations. The update also added some new kinds of building materials, and allows players to build their bases up to delirious heights. Here are some of the coolest and wildest bases that players are making right now. But you don’t have to get so extreme. Sometimes it’s just nice to have a good view. The new update also brings new kinds of structures. Now you can make materials out of carbon, which is much cheaper than making a base out of metal, and also gives your home a nice, cozy cabin feel. 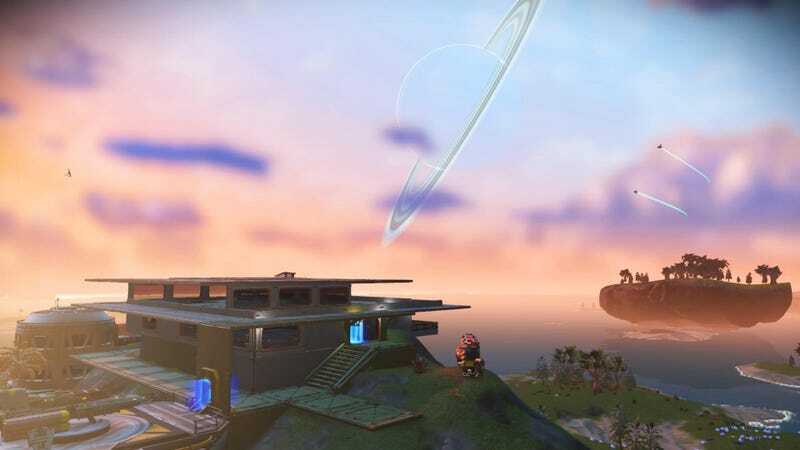 When Hello Games said that you can now build anywhere, they really meant anywhere. You can build into mountains, underwater, or on top of ancient ruins. The world is your oyster. My own base right now is still just a humble shack. Who knows, though. Someday soon I might be able to build a portrait of Sean Murray that is visible from space.